What kind of assemblage appears, when the scientific black box of territorial claims for the Arctic is opened in a legal context? Who are the primary actors, who do the Arctic as a scientific issue? Looking at the case of the Lomonosov Ridge, which techniques are employed in order to construct valid data that legitimizes extensions of national territories of the states involved? How can we understand the relation between scientific facts and the legal context they speak into by paying attention to the particular language, in which they are embedded? The aim is not to give an exhaustive overview of the Arctic controversy - not even a partial one. Rather we hope that the exploration of these questions constitutes an offset into the messiness of relations between techno-science, international law and the Arctic ocean. In suggesting a list of cartographic representations, we impose a certain order to the Arctic controversy. Not in order to freezeframe arguments or actors, but in an attempt to pass on the impression of floating around in a oceanic welter of technical instruments, scientific facts and precious (that is oil-rich) submarine formations. We provide a list of technical instruments, through which the sea bottom is measured, assessed and turned into a knowable object-of-concern. We also investigate what appears to be a curious submarine phenomenon, which plays a huge role for several Arctic countries: the case of the contested Lomonosov Ridge. 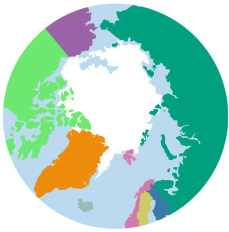 We map the dispute of the Arctic ocean bottom by illustrations and digital methods of Issue Crawler, googlescraper, word trees, bar chart figures, pictures and drawings. In naming the website The Right Arctic we wish to draw attention to a political, STS-inspired point regarding the multi-natural existence of things. In the lens of our oligopticon we find the Lomonosov Ridge, which appears to be several things depending on the scientific techniques by which the claims to the ridge are constructed. It is our wish that fellow students, social scientists and the like will enjoy this website and become informed by the maps created from digital methods as well as qualitative document analysis. Knowing that parts of the language in this website it theory-loaded, we also wish to share this knowledge with a science interested audience outside academia such as journalists and laypeople. The website is structured in a way that the viewer may read the categories from left to right including the sub pages arranged under each of the three main chapter. Reading the website as from a-z will build-up knowledge on the controversy in the composition of the main three chapters: Actors, Networks & Issues, Lomonosov Ridge and Legal Context that each relate to a component in our research question. This structure aims to give an impression of actors, networks and issues in the first chapter and then moving on to the actual territorial claims followed by scientific details in the second chapter. In the third chapter the controversy in contextualized by the legislative form that frame the territorial dispute.